Liza pushed her way to the door as the train rolled through the airlock into San Vital, even though it wouldn’t unlock until the pressure washer finished. Dust got into everything regardless, but rinsing the train at least meant there was less of it. She looked back. No sign of the guy who’d been tailing her, a known runner for the anti-alien Progressives. Liza knew better than to touch her pocket. Either the packet was there or it wasn’t; nothing she could do right now except attract attention. She slipped out the door the instant it slid open, muttering apologies to the people she shoved past. Her steady walk toward the Pratt Avenue exit barely faltered when the man fell into step alongside. She glanced around for a cop. “Officer, I’m smuggling alien artifacts and this guy is following me.” Yeah, no. What a prompt: the 1969 Manitoba election. There were no roads into these hills, barely any paths. Donkeys didn’t need much, nor did people used to the climbs. Used to nothing else, living in this landscape. I didn’t have a donkey, just a notebook, a set of sample jars, and a sturdy staff. Somewhere down this dusty path was a village, mentioned in the last census. Nobody had recorded how big it was, or exactly where it was located. I doubted the census taker even managed to find it. These hills were the epicenter of wild caraway diversity: more wild kinds than than the single weak species grown commercially. More flavor, different volatiles; more power to repel demons. We were desperate. I’d evaded patrols to get this far, hidden by the resistance. I scanned the vegetation as I walked, saving seeds in labeled jars, heading toward an unknown village, hoping someone could point me to a cure. At long last, an author copy of Genius Loci arrived in my mailbox yesterday. Hooray! I’m thrilled to be appearing in a ToC with so many great writers. Speaking of ToCs, I have sold a second story to Fireside Fiction. Unlike the last one, this one is completely fictional. It also contains one of my favorite images to date, but you’ll just have to wait to find out what that is. I will let you know when it will be available when I know. I have my schedule for Confluence, in Pittsburgh on July 29-31. Saladin Ahmed is Guest of Honor, and I expect it to be a great deal of fun. I’ll be a busy human, with four panels and a Kaffeeklatsch. I’m doing the latter with Chet Gottfried again, because we had fun last year. I expect there will once again be plenty of cookies. Whew! If you see me, say hi and provide caffeine and snacks, since I won’t have time for meals. Or just say hi: treats not actually required or expected. Guess what?!? The March issue of Fireside Fiction is out early, and you can read “The Kingfisher Manifesto” right now! Fireside is a good outfit, and I’d like it if you subscribed, joined their Patreon, or whatever, so they can keep paying writers and artists. Snow fell in rainbows, braided swirls of red and orange, indigo and violet, tiny colored crystals glinting in the wind. Where each flake hit the street, it drilled a smoking pinprick hole through the pavement. The trees were tattered, branches ragged and splintering. Miniature geysers marked the path of an unshielded water main. Anika had spotted a squirrel outside as the blizzard began, scampering toward safety. She’d watched it dissolve from behind a double thickness of glass; she wasn’t going outside any time soon. She’d never realized squirrels could scream like that. Anika wrapped her hands around a mug of cocoa, its heat doing little to relieve her chill. A memory of catching snowflakes on her tongue rose in her mind, a relic of times when snow was white and fluffy, and melted only into water. Sledding, forts, snowmen. Anika clutched her mug and watched the rainbow snow endlessly falling. It’s been a long time since I’ve written any word-count flash. This one is exactly 150 words according to Scrivener. Maybe it will make you all feel better about the snow you are getting, if you are. What do you think: post-apocalyptic cats, or a faery guide? Meanwhile, I’m trying to get my head back into writing fiction (back into everything, really). I’m picking the novel I started a year and a half ago back up. I won’t have time to work on it heavily until October, but I’m trying to get the outline firmed up so that in October I can immerse myself in the actual words. Not only has GENIUS LOCI funded on Kickstarter, we’ve already blown past the first stretch goal (my favorite: a pay increase for the authors). The next stretch goal is for the readers: more artwork! I admit, I’d kind of like to hit the $22,000 stretch goal of a ridiculously attractive book, with foil embossing and deckle edges and such. Wouldn’t that look lovely sitting on your shelf? You should all go increase your pledge right now, to make sure that you get the print book and that it will be so amazingly lovely. Or not, if fantasy and horror aren’t your things, or if you’re broke, or whatever. Y’know, nothing to feel horribly guilty over. I’ll let you read my contributor copy, just not borrow it. 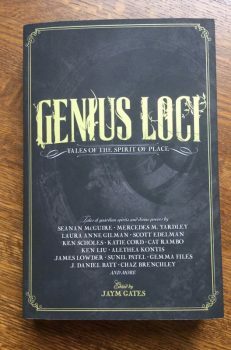 That’s right, the long-awaited Kickstarter to fund the Genius Loci anthology is here! So many fabulous authors, including Seanan McGuire, Chaz Brenchley, Cat Rambo, Ken Liu, (stopping here before I list EVERYONE), and ME. I am utterly utterly utterly thrilled to be part of such an amazing table of contents. So please take a look, and if it sounds like your kind of thing then consider sponsoring the Kickstarter. I have submitted five stories today. FIVE. I think that beats my previous monthly total. Not only that, I think I’m caught up: the two still languishing were written in 2011 and aren’t up to my current standards. I either need to completely rewrite them or trunk them. I am now completely braindead and exhausted. I was checking out at the grocery store. The undergrad-looking clerk told the guy ahead of me that he was doing a project for class on classic movies. The two of them discussed The Princess Bride and a few other things. When my turn came, the clerk asked me my favorite movie? I asked if he wanted classic, and he said sure. “It’s in black and white, even. But it’s an excellent movie: Humphrey Bogard, Ingrid Bergman.” This time the blank look was his. I proposed The Usual Suspects as a “newer classic.” He’d at least heard of Kevin Spacey. We discussed The Shawshank Redemption and Stand By Me, apparently both more his idea of classics, though he hadn’t seen either. I left him with a parting admonition to watch Casablanca. I wonder if he will. I came away feeling old, and sincerely hoping that this guy isn’t a film major.